As much respect as I have for David Cage, I hadn’t actually played Heavy Rain before. I didn’t have a PlayStation 3 when it first launched, and when I did eventually pick one up, there were an awful lot of games I had to catch up on. Related reading: Beyond: Two Souls, David Cage's other masterpiece, is also available on PlayStation 4. Brad's full review. But that worked out for the best, because I got to enjoy the mystery of the Origami Killer for the first time on the PlayStation 4, and this game scrubbed up great. Though it’s obviously a HD remaster (and thus not of the same visual standard of a game built natively for the console), it’s a truly classic game – and narrative – and really deserves to be played in the highest quality possible. The game very much feels like a David Cage’s take on David Fincher’s noir thriller, Se7en. 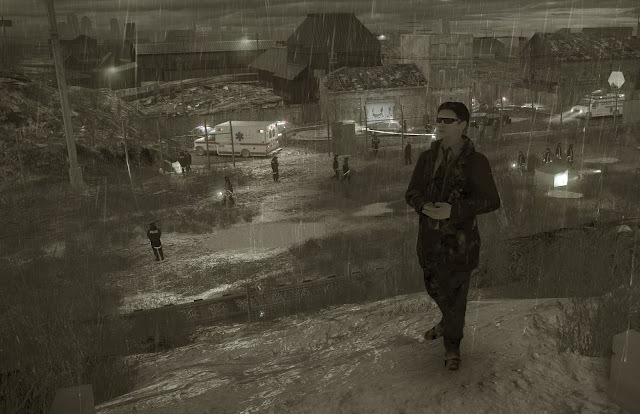 The aesthetic between the two games is shared; a perennially drenched city, with water symbolising both the dredgery of life in modern urban cities. Just as rain creates a veil that makes objects in the distance indistinct and hidden, so too are the main characters all keeping deep, dark secrets of their own. Just as water in cities is never clean, so too are the people that suffer through existence within them. The melancholia present in both Cage’s game and Fincher’s film came from different places. On an audio commentary of Se7en Fincher said, ironically, that it was his “love letter” to living in the city, where Cage’s muse is the intense feeling of loss (in Heavy Rain, the water also symbolises the mental anguish the leading character lives with after losing his son to tragedy). The end effect is the same; these are dreary experiences and require a certain mood to fully appreciate. I don’t mean that in a negative sense in the slightest. I spent six months breaking Se7en down, frame-by-frame, for a major essay back at university. It’s very much an example of film at its most artful. However, before you even get in to the narratives, the aesthetics of both art works are instant indicators that there’s an intensity to the experience that is going to demand full focus from its audience. And what a story Heavy Rain has to tell. After losing his son to tragedy, the aforementioned protagonist, Ethan Mars, loses is other son some months later to a kidnapping, which is instantly attributed to the “Origami Killer” – a monstrous serial killer with a penchant for drowning young boys. What’s more, this killer wants to play Saw-like games with Mars, forcing him to pull off dangerous stunts in order to have a hope of rescuing his boy. By itself Mars’s efforts to save his child would make for a compelling narrative, but Heavy Rain also follows the stories of a number of other conflicted and flawed individuals; an ex-cop PI, an FBI agent with a severe case of the shakes, a woman who struggles to sleep, after experiencing nightmares of a home invasion. All these characters have their part to play in an unfolding mystery that, like the best in the genre, has plenty of twists and turns to keep things interesting. For me, it’s the way the game plays in the noir genre without being dominated by it that is most compelling – again, as was the case with Se7en. With a real eye for cinematics, Cage cleverly recreates the classic venetian blind effect of the genre, makes liberal use of darkness in combination with the rain to symbolise the apathetic and dark underbelly of society and that allows a creature like the Origami Killer to flourish, and throws in the hardboiled detective, but consistently he subverts expectations to put a modern spin on what would otherwise become too much like Raymond Chandler. The femme fatale is not the smouldering sensuality that you might expect from “crime noir.” The hardboiled detective role is filled with a guy that spends a solid couple of minutes cradling a baby to sleep and is less hardened, more defeated. And when Cage really wants to make an impact, it hits home. In a scene almost identical to a key scene in Se7en, the police officers kick down a door to a suspect’s home and begin searching the place illegally. Unlike in Se7en he doesn’t turn out to be the culprit, but his home is nevertheless both striking and visually terrifying, with thousands of crucifixes and religious writings on the walls suggesting someone quite unhinged, guilty of this particular crime or not. Then the inhabitant returns, and without giving anything away, I was presented with a split-second decision to decide on whether I needed to shoot him or not. Related reading: Another great example of narrative-focused gaming is Life is Strange. Matt's review of the first episode of this essential series here. I’m not going to give that away whether I turned out to be right in my intuition, as it’s something you should decide for yourself if you haven’t yet played the game, but I shot the guy and had to put the controller down and think to myself whether I was genuinely justified in doing that… or even why I made that gut decision in the first place. Moral conflict and consequence is, of course, a central theme to the crime noir genre, and while Cage isn’t quite as capable as Fincher was of really going all in and creating a villain that would genuinely test the thinking of any moral philosopher, he does an admirable job nonetheless. The decisions I had to make in Heavy Rain were among the most difficult I’ve had to make in my games, ever. The quality writing would have been for nothing were the performances poor, and while Heavy Rain doesn’t have the star power of the likes of Ellen Page and Willem Dafoe that Cage was able to draw on in Beyond: Two Souls, the actors in this game are of a universally high standard, and manage to convey emotional depth and nuance through their performances. Sam Douglas as the detective, Scott Shelby, I found to be especially impressive. Softly spoken and asthmatic, for the most part he plays out as a bumbling old dad-like figure, and is hardly the imposing physique. He looks much more at home when he’s caring for a baby then on the hunt for the killer, which is why it is so impressive when he does lay a veteran police-trained beatdown on his opponents. Reluctant hero, cynic, and emotionally dulled by what he has seen, Shelby is a delightfully complex character and a brilliant re-interpretation of the hardboiled detective role in crime noir. The violence of the game is really quite intense at times, and is often far more prolonged than we are used to in games. Because everything is managed through QTEs, Cage has been able to choreograph long, multiple-minute sequences, and because the player is directly involved in them, the impact they have is quite high. I found the attack on Madison Paige to be especially effective. One of the longest action sequences of all, as good as Paige gave to the invaders they were still throwing her around a lot, and given she is wearing nothing but her underwear in this scene the vulnerability on display is palpable. There’s probably some feminist commentary in there (though I would hope Cage is recognised instead for having a genuine approach and respect to female characters), but I felt absolutely horrible when I made one or two mistakes through that particular QTE sequence. Cage spends a lot of time in his games forcing you to participate in QTEs that are seemingly arbitrary and pointless, but the secret is that those sequences connect you on a simple, but deeply emotional level to the characters so that when they are placed in dangerous or violent situations, you feel far more responsible for their survival. To put it another way, when you participate in QTEs to drink a carton of juice, open each door, or juggle, you are participating in the simple, mundane activities that make ever human being does every day. That way, when it comes time to do something more traditionally “gamey” through those same QTEs, they are much easier to related to. Where you might never have had to fend of a half dozen attackers in your underwear (and I certainly hope that’s the case), you’ve certainly drunk juice from a carton before. Your shared experience in drinking juice with your virtual avatar gives you a stronger empathy in also sharing the experience when she’s trying to survive an assault. 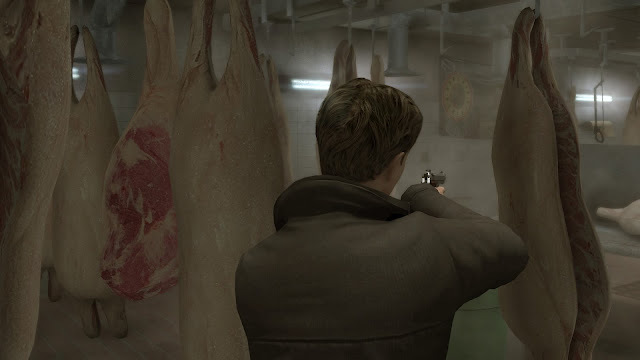 And that’s why I’m always so surprised that so many people don’t seem to like the way Heavy Rain “plays.” There’s this perception that because they’re essentially one very long QTE experience, and because we’re meant to hate QTEs, we must therefore decry the “gameplay” of a David Cage game. Certainly most games don’t do QTEs well, but then most games throw QTEs in there because they are an arbitrary way of getting a player to do things during a cut scene. But in all Cage games – Heavy Rain included – QTEs aren’t arbitrary. They are a very deliberate and meaningful way that Cage uses to build a connection, on a human level, between player and character. Then, when those characters get up to outlandish things, there is a greater intensity to them. And, again, for me in this game, it worked. I cared, deeply, about the characters and the situations they were thrust into. Related reading: Matt's massive interview with David Cage, in the lead-up to the release of Beyond: Two Souls on PlayStation 3. In addition to an emotive soundtrack that perhaps strays a little too far on the sentimental to really reflect the darker themes running through Heavy Rain, on the PlayStation 4, this game looks gorgeous. Cage’s eye for cinematography means that, though there are only a couple of different camera angles available for each scene, each one is meticulously selected to both enable function and visual opulence. Each set is meticulously crafted, and of an equal to what you might see on a film set, and the attention to small details further reinforces Cage’s commitment to place Heavy Rain in the realm of normality; in each scene there are point of interest and things you don’t need to see or do, but they are there because in the real world they should be too. Cage’s games, meanwhile, don’t indulge that. What you as the player do, and how you do it, does have some impact on the flow of the story, but it’s not immediately obvious what that flow might be. This is again Cage’s cinematic style, and he would rather have a narrative that subtly and organically shifts rather than leave players with the impression that they’re flipping switches, but at the same time it tends to undersell his games; you’re never quite sure if what you’re doing is having any impact at all. That might be a negative to you. It’s not really to me. 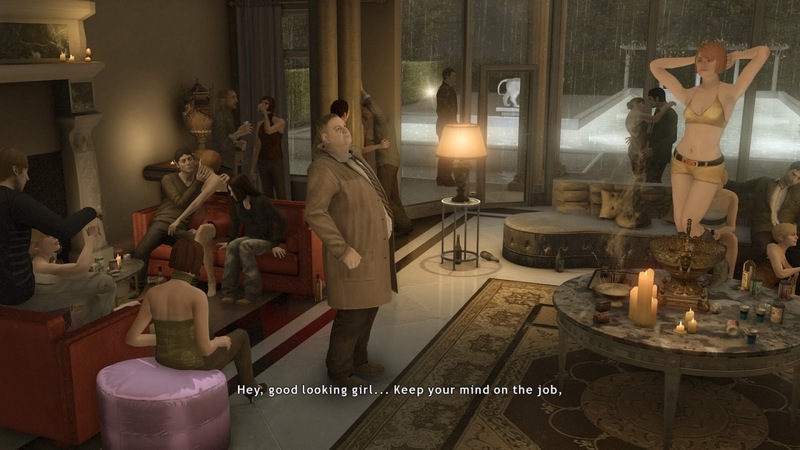 Heavy Rain is very much the kind of game I like to play; it’s smart, interesting, different and highly focused. Cage might be a one-of-a-kind game director and thinker, and I do wish more developers paid attention to how he approaches his storytelling.